2019 Rope Mill Spring Thaw Trail Run - March 16, 2019 - Race #1 of the Mountain Goat Adventures Trail Run Series! Directions to Blankets Creek Park - NOTE NEW VENUE!! Camping is not allowed at Blankets Creek, however there are several campgrounds along Lake Allatoona, which is 20-30 mins north of Rope Mill Park, depending on which location you choose. The race will feature the following age group categories for both the 10 mile and 4 mile race. Awards will be presented to the top three male and female finishers in each age group, in each race. We will also recognize the top three overall male and female finishers in each race. All kids race participants will receive a finisher medal. The awards ceremony for the 4 mile race will take place at approximately 9:45 am. The awards ceremony for the 10 mile race will take place at approximately 10:15 am to allow the majority of racers to finish. You must be present at the awards ceremony to receive your award. Awards and prizes will not be mailed. If you win something and bail on the awards ceremony, your prize will be added to the raffle goodies pile or given to a race volunteer. We will also offer a FREE kids 10 and under race, which will be approximately one half mile long. All kids race participants will receive a finisher medal. The kids race is not officially timed and no pre-registration is required, however parents must sign a waiver for their children at registration. 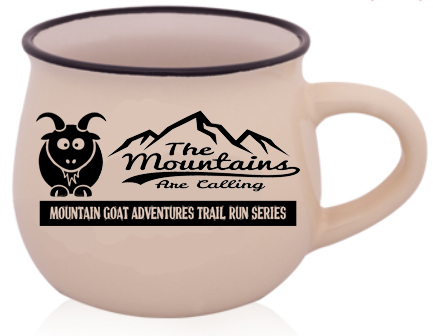 All registered racers will receive a soft cotton blend race t-shirt and the first 250 to register get one of our new "Mountains are Calling" Coffee Mugs! Free Race Photo downloads courtesy of the Georgia National Guard! Please register by March 2 to guarantee your shirt size. If you register after March 2, you will still receive a shirt, however limited sizes may be available. 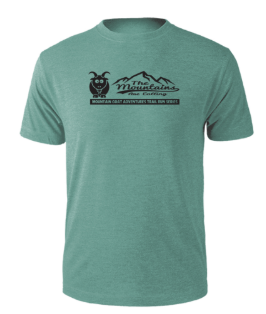 If we run out of event specific shirts, you will receive a Mountain Goat logo tee with your registration. Shirts run true to size. The race will run rain or shine, however, the Race Director reserves the right to cancel or modify segments of the event as deemed necessary for participant safety or preservation of trail. No refunds will be given in the event of an act of God that requires cancellation of the race for the saftey of participants. Once the race has started, no refunds will be given due to delayed start or early conclusion of the race.